A nursing home is a place for people who don't need to be in a hospital but can't be cared for at home. 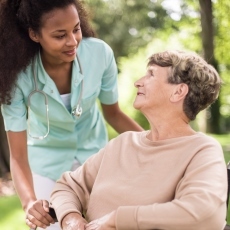 Most nursing homes have nursing aides and skilled nurses on hand 24 hours a day. Some nursing homes are set up like a hospital. The staff provides medical care, as well as physical, speech and occupational therapy. There might be a nurses' station on each floor. Other nursing homes try to be more like home. They try to have a neighborhood feel. Often, they don't have a fixed day-to-day schedule, and kitchens might be open to residents. Staff members are encouraged to develop relationships with residents. Some nursing homes have special care units for people with serious memory problems such as Alzheimer's disease. Some will let couples live together. Nursing homes are not only for the elderly, but for anyone who requires 24-hour care.